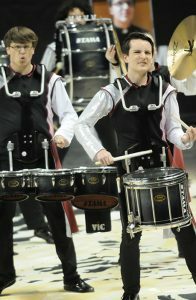 The Mid Atlantic Percussion Society Competition comes to Unionville High School, March 11. Rock out to music, excitement and artistry as 22 of the finest indoor percussion ensembles from 3 states compete at the Mid Atlantic Percussion Society Competition at Unionville High School on Saturday, March 11, 2017 from 3pm to 10pm. Performing groups will use a broad array of percussion instruments including drums, cymbals, marimbas and sophisticated electronic effects to present their dramatic shows. They are judged on marching and concert criteria with judges evaluating each group’s creativity, expression, performance quality and technical excellence. The event is hosted by Unionville High School, whose Indoor Drum Line and Indoor Color Guard will perform their award-winning 2017 shows, “The Drought” and “The Lair” in exhibition. Also performing in exhibition will be United Percussion of Voorhees, NJ, an indoor percussion ensemble that has been a Winter Guard International World Finalist for the past 14 years. The units facing off in competition will be from the following high schools and independent guard groups: Rustin, Highland, Methacton, North Penn, Hempfield, Abington, Coatesville, Williamstown, Owen J. Roberts, Ridley, Southern Regional, Bayonne, Bensalem, Downingtown, Hopewell Valley, Upper Moreland, Upper Darby, Cab Calloway, Old Bridge, Spring-Ford and Pennsauken.